09.30 AM: We will leave the hotel after breakfast for a classical Old City Tour. We will start our tour with ancient Hippodrome Area, the sporting, social, and political centre of the Constantinople, the capital of Byzantine Empire. After Hippodrome, we will visit historical Blue Mosque, also known as Sultan Ahmed Mosque, which is famous with its blue Iznik tiles covering its interior walls. Afterwards we will walk to Hagia Sophia Museum, which was the main church of Constantinople, later a mosque, and now a museum. Then we will see the Underground Basilica Cistern, which is the largest of several ancient cisterns that lie beneath Istanbul. 12.30 AM: Lunch break will be given at Sirkeci district. 01:30 PM: After lunch break we will visit the largest palace in Istanbul, Topkapi Palace Museum which was the primary residence of the Ottoman Sultans for approximately 400 years of their 624-year reign. We will visit pavilions, weapons, kitchen, Imperial Harem and Imperial Treasury sections to see the life of Ottoman family, also art, jewellery, and heirlooms belonging to the Ottoman dynasty. 03.30 PM Following the Topkapi Palace tour, we will visit one of the largest and oldest covered markets in the world, Grand Bazaar, which includes 61 covered streets and over 3.000 local shops. We will walk around, take photos and shop there approximately for 2 hours. 05.30 PM: We will proceed to your hotel for a short rest. 06.45 PM: We will leave the hotel for Whirling Dervishes Show. The Whirling Dervishes are famous with their meditational whirling motion, accompanied with mystic music, to praise God. In 2005, UNESCO proclaimed the “The Mevlevi Sema Ceremony” as amongst the Masterpieces of the Intangible Cultural Heritage of Humanity. 09.00 PM: We will proceed to Eminonu district for dinner. 10.30 PM: Following the dinner we will return to your hotel. 09.30 AM: We will leave the hotel after breakfast for a private boat tour on Bosphorus. During this 2 hours boat tour we will see and take pictures of the palaces, historic fortresses, seaside residences, and green parks both on the Asian and European sides. At the end of the boat tour we will land on Sariyer, the northernmost district of Istanbul on the European side. 12.30 AM: Lunch break will be given at Sariyer. 01.30 PM: Following the lunch-break, we will get in to our private van and drive to the Fatih Sultan Mehmet Bridge. As we cross over the Fatih Sultan Mehmet Bridge and get to the Asian side of Istanbul, you will make the shortest inter-continental trip between Europe and Asia. When we reach the Asian side, we will head towards Beylerbeyi Palace, which was an Imperial Ottoman summer residence built in the 1860s. Afterwards we will proceed to Uskudar, one of the oldest districts is Istanbul. We will walk around the Uskudar’s fish and vegetable market where you will find a wide variety of shops, small restaurants, and groceries. Then we will go to the Camlica Hill which is surrounded with a beautiful little forest. Due to its height, 288 meters above the sea level, The Camlica Hill is the highest peak in Istanbul. 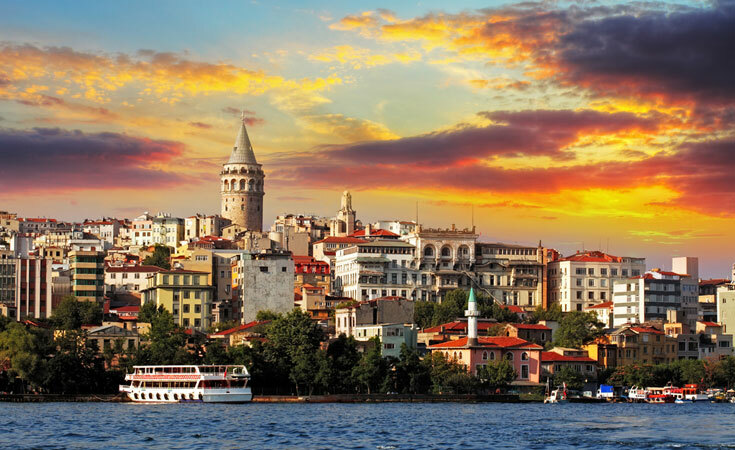 It enables you to see a spectacular view of the Bosphorus and the Old City while drinking your tea or Turkish coffee. 04.30 PM After visiting Camlica Hill, we will return to your hotel by our private van.